Today is our very final guest! Can you believe Once Upon a Thread is coming to an end? I'm sad and relieved all at once, but have had such fun this month and been inspired by all those who participated. Cheri from I Am Momma Hear Me Roar is here today with one of her cute boys. Cheri's blog is uplifting, if I could sum it up in one word. Not only is she always positive, but she encourages others to be positive as well with her "Wake up Wednesday" challenges of doing something good in the world. Or her bag pattern that she made for the purpose of donating the proceeds toward the Japan Relief efforts, which was extremely well received. And then there is her creativity she uses for her boys. What little boy wouldn't want Cheri as their mom! 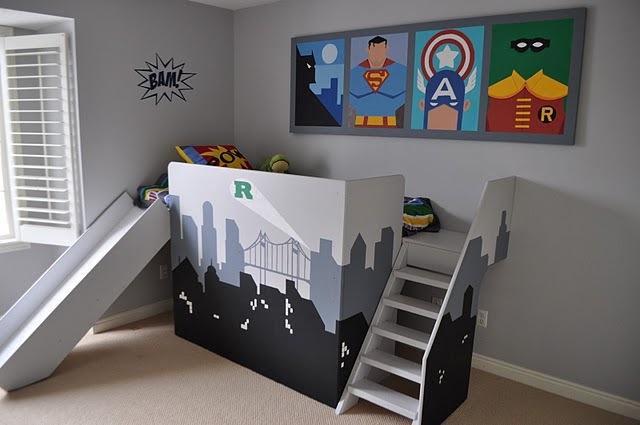 Take a look at what they get to have as their bedroom! What a treat to have Cheri with us today! Hey No Big Dill readers! I am excited to be here today. Katy's blog is incredible and packed full of creativity. Today I'm sharing my very favorite children's book with you. It's called "Someday." It's simple and beautiful and frankly, it makes me tear up everytime I read it. I love the simple, pretty illustrations. The illustrations include a girl, but I don't have girls. I have 2 boys, so I wanted to create an outfit that felt like this book. The clothing the little girl wears almost always includes stripes. It's baggy and free flowing. So I used Dana's fabulous pants pattern to make comfy pants for my little guy. I upcycled an old striped shirt from my husband. Here they are. I even left the shirt pocket on because I thought it landed in a cute place. It's hard to see unless the photo is super close, but they are striped. I based the shirt on this page. My little guy loves to swing as high as I'll push him on the swings. I used an exisiting shirt and stitched on a swing. Then I wrote the words with a fabric marker. "Then you were my baby. Now you are my child." ...because I know time is going to fly. I wish I could show you all the pages, but here's the last one. 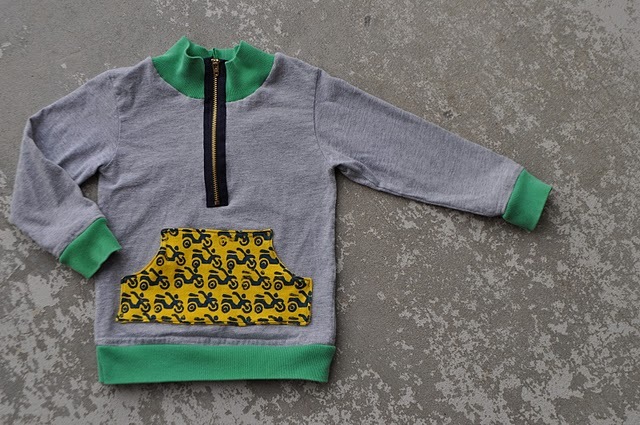 And here's the comfy number for my little guy. Great for playing, running, and swinging. Thanks for having me Katy. It's been a fun month. All of you are welcome at my place anytime. Have a great day! What a perfect little play outfit! Thank you for popping in today, Cheri! I gave that book to my mom for Mother's Day one year. I just love the illustrations, and you captured the spirit perfectly!How sweet to be able to encourage your kid even through the clothes they wear! That book just made my "needed for library" list. Looks like such a wonderful story! Love the outfit too! So cute!! This book makes me cry every time I read it, and we read it almost every night. I love the boy take on the outfit! Love, love, love that. The swing shirt is the icing on the cake. And now I must find that book - we've never read it. so cute! love those pants! I want a pair! I'm loving this series! SO MUCH! I don't want it to end! ADORE! ADORE ADORE! ! I had to stop and grab a tissue ... that post made me cry! :o) I'm off to Amazon to find the book! The outfit based on the illustrations is simply adorable. I'm a huge fan of her blog! What a beautiful book and cute outfit:). I'll have to check that one out! The pants and shirt look awesome. Of course everything Cheri does is awesome. The pocket on the pants=adorable. This book is one of my favorites, too. Great idea! My mother gave me this book shortly before she died two year ago... I'm currently 6 months pregnant and plan on reading it to my son. This post made me tear up... Love the outfit. These are wonderful ideas! 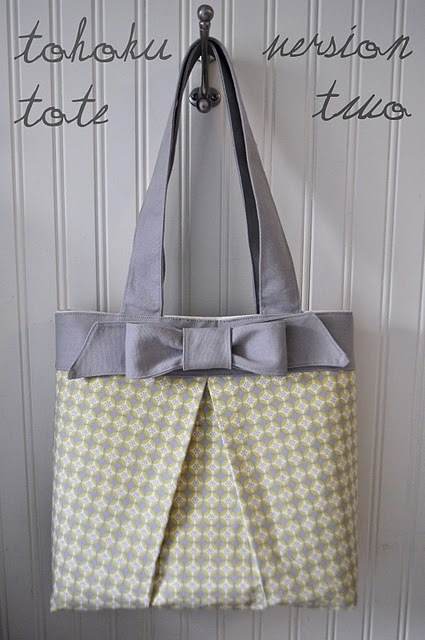 Can you give me the link where I can get the tote pattern! Would be great! Thanks! Honestly, I'm really sad that this series is coming to an end! Every post has been lovely. Have you thought about starting it as a second blog? With all that free time you have as the mother of five girls, a blogger, a sewist, etc.? ;) Really, this would make a great blog, and you could expand the guests not just to sewists, but to people of all crafts. Knitting projects inspired by children's books, craft projects inspired by children's books, and so on. Darling outfit! Part of my favorite thing about this whole series is being introduced to so many great books I didn't know before. This one looks so sweet. I am really going to miss coming every morning to see what the latest book project is. Thanks for doing this! Love that book! Alison and Peter are a great team. 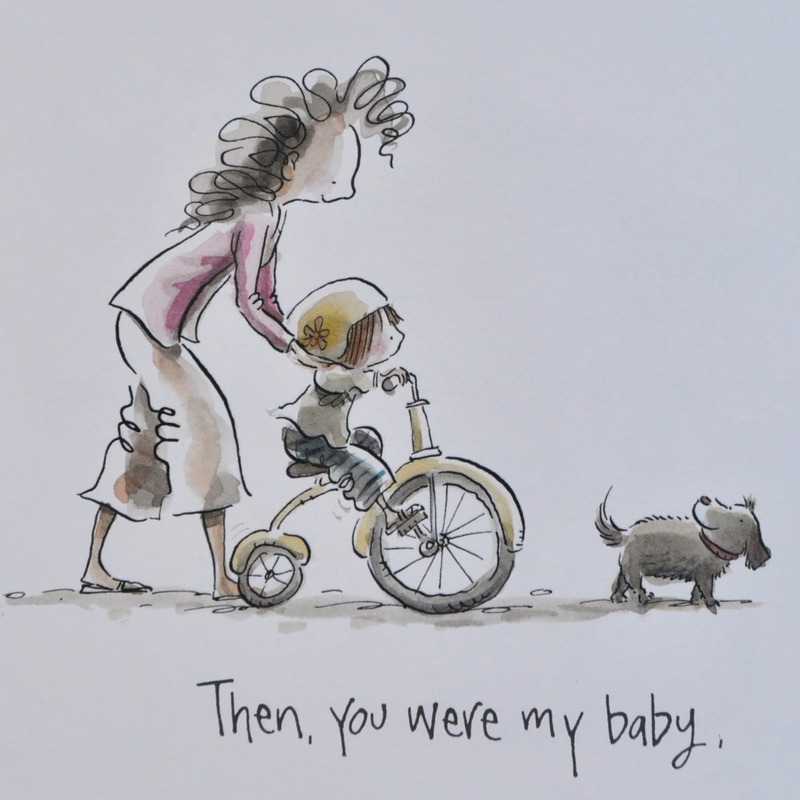 And a great reminder to enjoy the time we have with the little ones in our lives.